Map charts have one key value and one data value. For example, you could map the revenue distribution by customer. Open a new or existing report in Report Designer. If you are creating a new report, specify the data schema to be used for the report. From the Tool Box view, drag and drop the Map Chart into a container on the report design. 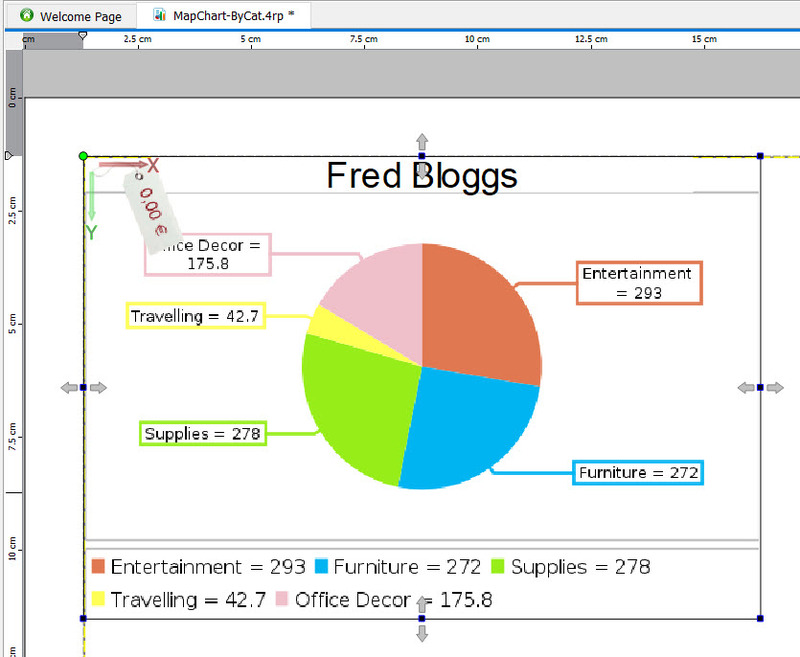 The Design Window contains a Chart object and its related Item object (shown as a price tag). Draw As - the type of chart, for example, Pie or Ring. The default is a pie chart. Sort By - sort alphabetically, numerically, or by input order. Sort Ascending - sort in ascending or descending order. DrawLegend - include or exclude the chart legend. Tip: When several similar charts are drawn next to each other, set DrawLegend to False on all charts except one. The charts now appear to be sharing the same legend. DrawLabels - include or exclude the chart labels. Key - The data item that summarizes the data. For example, in Figure 1, the key is the category name. The key must be a String. To use a non-string value, define a custom string for the key, using the data item in a expression. Value - The data item that contains the numbers to be charted. For example, in Figure 1, the value is the unit price. The value must be Numeric. Color - The color of each slice in the map chart. If not specified, the slices display using the Genero default colors. See Coloring a map chart. You must modify the report structure to ensure the chart displays as required.